This dish is becoming a firm family favourite. It makes an excellent, quick, midweek dinner and can be easily adapted to please the fussy tastes of children. This was the dish that I always used to order at Wagamamas. I don’t bother now that I can make it so easily at home but the reduced portion sizes at Wagamamas have put me off going there in any case. In this recipe everything revolves around the sauce and noodles. You can then freestyle the rest adding whatever vegetables are in your bottom drawer of your fridge. The original recipe (from Tim Anderson’s ‘Nanban – Japanese Soul Food’) adds beansprouts and mushrooms but I generally use cabbage and carrots because I always have those in and everyone in our household likes them. Tim also adds bacon and you could add chicken or prawns if you like, but I prefer to keep it vegetarian. With regards to the noodles, I use ready made quick cook udon noodles which I buy from Tesco. Loyal followers of this blog may remember that I did once attempt to make my own but this was very hard work (you have to knead and walk on the dough multiple times and then hand roll the noodles!). I generally don’t mind putting in the effort if the end result is fabulous but in this case the final noodles were a bit rugged and rather stodgy. My children don’t like onion and so I only put the crispy onion and spring onion on the adult plates. Likewise with the sesame seeds. Everyone likes the omelette topping though and the children squabble over who gets the biggest portion of this. This makes a large amount. You will need a large wok, otherwise cook in two batches. Heat a little oil in a large wok until hot. Stir fry the carrots for 1-2 minutes. Add the ginger, garlic and cabbage and stir fry for another 3-4 minutes until wilted. Mix up the ingredients for the sauce and add to the pan, then stir in the cooked or straight-to-wok udon noodles. Stir fry for another couple of minutes until heated through and then serve. Garnish with the sesame seeds, egg, spring onion and crisp fried onion (or any combination of these that you like). Up until very recently meringues have been my culinary nemesis (along with brandy snaps but that’s another story). I was going slightly crazy because I just couldn’t work out what I was doing wrong. I tried lots of recipes and followed all the advice (buying fresh eggs, scrupulously cleaning the bowl and whisk, separating the eggs with great care). But they would always collapse when I added the sugar, making a sticky, sickly-sweet, flat disc that was barley edible. You may wonder why on earth I kept at it. Well I often make other things (custards, ice cream) that use only the egg yolk and meringues are the perfect way to use up the white. Also my grandma is a champion meringue maker and it just didn’t seem right that I couldn’t do it. But the in the video the presenter used the two regular beaters instead. And when I did that they came out beautifully. So I am now making meringues regularly and very happily (hence the need for the recipe to be recorded on this blog). Set your oven to 150oC (fan). Carefully separate your eggs making sure to get no yolk at all in with the white. Save the yolks for another use. In a very clean, glass bowl, beat the egg whites with your electric hand blender (using the two regular beaters) until you get stiff peaks (in other words the mixture would stay in the bowl if you tipped it upside down). Measure out 50g of caster sugar for each egg white used. Add this to the egg white a dessert spoonful at a time, mixing after each addition for about 10 seconds with the electric whisk, before adding the next. At this point I like to swirl a bit of gel food colouring into the mix for a nice effect (yellow is used in the photo above). Dot the food colouring into the mix with a cocktail stick and then swirl a couple of times with a metal spoon. Take a baking sheet lined with baking parchment and dollop the meringue mix onto the sheet using a metal spoon. You can make the meringues any size you like, or shape into a large circle with an indent in the middle if you are making a Pavlova. 3 egg whites will make five large meringues (as above) or one Pavlova. Put the meringues into the oven and immediately turn the oven down to 140oC. Bake for one hour, then turn the oven off (do not open the door) and leave in the oven overnight until they are completely cool. Despite having my own blog I don’t follow many others, but I’d like to tell you about two of my favourites, just in case you don’t know about them already. The first is Recipe Rifle by Esther Walker (she’s the wife of Giles Coren but don’t let that put you off). There’s usually a recipe but the bit I like most are the introductions – hilarious and honest stories about her life with young kids. If (like me) you are often exasperated by your children, do trawl through the archives of this blog – you’ll feel as though you’ve found a friend. Esther eloquently tells it how it is – putting in words what many of us really feel about motherhood whilst outwardly smiling and telling our friends how much we’re ‘loving it’. In complete contrast is smiley Emily who writes ‘Cupcakes and Cashmere‘. This blog is the epitome of shallow but it’s beautiful presentation lures you in like, well just like a pretty cupcake. She writes posts like ‘How to style your bookshelf’ (you mean there’s another way apart from alphabetically?). Her food is always tiny, and immaculately presented and often includes stars, hearts and sprinkles. Despite becoming a new mother recently (when surely it should have all gone to pot!) she continues to look elegant wearing tiny skirts and beautiful shoes. There are no photos of sleep deprived/puffy eyes, there is no whinging, just lots of sunshine and all American positivity. I should hate her but Emily is so likable and sweet – like a Disney Princess. Reading her blog I feel as though she genuinely wants to show me a better way. But Esther is now finishing her Recipe Rifle blog which I’m gutted about, but on hearing her disarmingly honest reasons perhaps it’s for the best. It seems that Esther fears turning into Emily, or rather she fears that ‘Recipe Rifle’ will become like ‘Cupcakes and Cashmere’. From my point of view I don’t really want to read one without the counter balance of the other, so I’ll probably give up blogs entirely and read Victorian novels and Elizabeth David cookery books instead. Anyway, despite food being a key part of both of these blogs, I have only ever tried one recipe from either. It was this Martha Stewart one which Emily recommended, accompanied by some photos of her own version which were, of course, more beautiful and perfectly formed than the original. Mine were ugly but tasted delicious. I also had the idea of adding lavender instead of rosemary to half the batch. This was with my son Edgar in mind. He hates ALL fruit but eats lavender straight off the plant without blinking an eye. Mix the butter and the sugar together until pale and fluffy. I used an electric hand whisk for this bit but you could probably just use a wooden spoon. 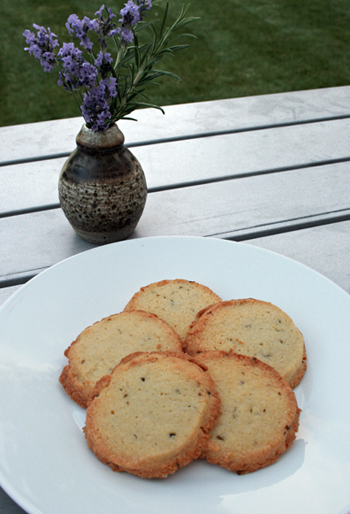 Mix in the egg and vanilla extract, then add the flour, salt and rosemary OR lavender. Mix until well combined. 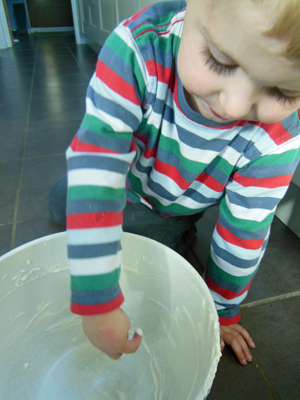 Halve the dough and shape each into a log with floured hands. Place each log on a square of baking parchment and roll up into a log about 3 3/4 cm in diameter twisting the ends to keep the shape. Put in the freezer for an hour to firm up. Cut each log into 1 cm thick rounds and place on a flat baking tray lined with parchment. You will need two trays and probably two batches for this amount. Bake until the edges are golden 15-20 minutes (mine were pretty well done after 15). Cool on wire trays and store in an airtight container. Martha recommends using a loo roll around the log to hold the shape while freezing. I didn’t think this was necessary. She also paints the logs with egg white and rolls in sanding sugar before cutting into rounds. I still don’t know exactly what ‘sanding sugar’ is (they don’t sell it in Tesco so I think you may need to find a specialist cake decorating shop). I used granulated sugar instead on half the batch but to be honest preferred the ones without. Even though we don’t celebrate Easter and don’t buy eggs for other people, we seem to have a ridiculously large number of Easter eggs in the house. You may think this is a good thing, but then you’re probably a disciplined person who has the will power to make your eggs last until Christmas, carefully limiting yourself to a few nibbles each evening. I am not like this. Whilst I don’t really buy chocolate, if I know it’s in the house then it plays on my mind, whispering ‘eat me’ and tormenting me to the point that I just have to eat it all up very quickly so that it’s gone. The children are the same. If they know chocolate is easily available then they nag at me constantly, behaving well to get it and then turning into little monsters once they’ve eaten it. With all this in mind, I’ve been looking at recipe ideas for leftover Easter eggs so that I can bake some treats to give away. There are lots of recipes which claim to do this which had to be dismissed when it came to the ingredients listing requiring ‘Xg of good quality dark chocolate’. Good quality…dark chocolate…I’m not sure where they are buying their eggs from? 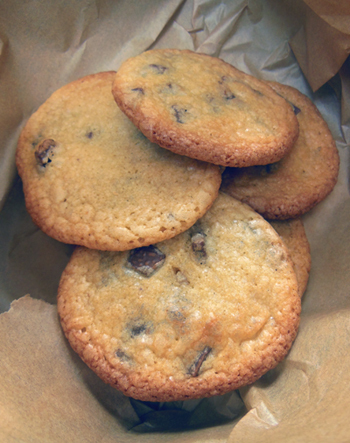 In the end I made these 10 minute chocolate chip cookies based on a Hugh Fearnley-Whittingstall recipe. The children really enjoyed making them and they are yummy. Eat one yourself, let the kids have one each and then give the rest away (and it won’t look like you’re trying to get rid of your Easter eggs at all). Set your oven to 190oC. Melt the butter in a saucepan or microwave. Measure the sugars into a mixing bowl, pour in the melted butter and mix well. Add the beaten egg and vanilla extract and mix well. Sift in the flour and baking powder. Add the salt and broken up chocolate and mix well. Leave the mixture for 10 minutes to firm up a bit, then spoon heaped teaspoons of mixture on to a flat baking sheet (line it with baking parchment if it’s not totally non stick). Leave plenty of space in between because they really spread out. I could fit 6 on one 33cm square baking sheet and therefore cooked in 3 batches. Place in the oven for 8-10 minutes until golden brown. Less time will mean a chewy texture, more and they will be crisp. Remove from the oven and leave on the baking sheet for a few minutes to firm up. Place on a wire rack until cool enough to eat. I have two distinct memories of Malaysia. The first is of a group of locals rolling about with laughter at Ben (my now husband) literally melting in the heat as we crossed the border. They had never seen such a sweaty man and it was very funny. The other is of eating Nasi goreng at the train station in Kuala Lumpur. It was just a cheap canteen type place but it was delicious – then again anything served with an egg on top usually is. Nasi goreng basically means ‘fried rice’ and with such a generic title it’s no wonder that there are seemingly infinite recipes for it on the internet. Some are very complicated and involve lots of specialty ingredients (if you don’t believe me see Rick Stein’s recipe on the BBC food website which was enough to send me into a mild panic). 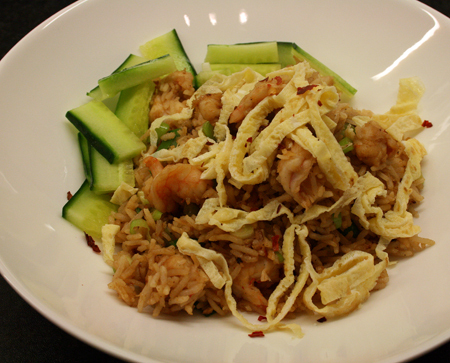 This version is adapted from one in my ‘Essential Asian Cookbook’. It is fairly simple but has the characteristic sweet and salty flavour which makes it taste fairly authentic. First make the omelette garnish. Beat the eggs until foamy and add a pinch of salt. Heat a little oil in a large frying pan. Put half the egg mixture in the pan and swirl around until you have a very thin layer of egg. When set (about 1 minute) flip over and cook for a further 30 seconds. Repeat with the remaining egg mixture. Roll both omelettes up tightly and cut into fine strips. Set aside. Put all the ingredients for the spice paste into a food processor or pestle and mortar and grind or pound until you have a fine paste. Heat a tablespoon of oil in a wok until smoking. Add the spice paste and cook for a minute, then add the prawns and stir fry until warmed or cooked through (this will depend on whether you are using cooked or raw prawns). Add another tablespoon of oil to the pan and then tip in the rice and cook until it’s heated through, stirring regularly to break up any lumps. Then add the soy sauce, kecap manis and spring onions and stir fry for another minute. Serve with the sliced cucumber and thinly sliced omelette. Note: If you like you could use finely sliced chicken breast or rump steak instead of prawns. You could also substitute the omelette strips for a fried egg. Crispy fried onions as a garnish are also nice if you can be bothered. I dream about baked vanilla cheesecake – it’s my favourite dessert of all. This week I’ve been reading about the last food requests of people on death row and this would definitely be my pudding of choice for a final ever meal. 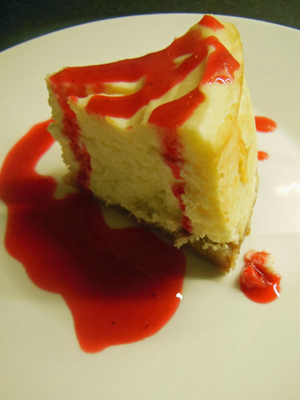 I have tried lots of different recipes for baked cheesecake and have always struggled with the texture. They have tended to be a little on the stodgy side and rather claggy. I think this recipe works well though. It initially started out as a Mary Berry but I’ve adapted it by whisking the egg white to give it a lighter texture. It’s good on its own or with a raspberry sauce. Preheat the oven to 150oC fan. For the base, crush the digestives in a food processor or in a food bag with a rolling pin. Melt the butter in a saucepan and add the crushed biscuits and stir until incorporated. Tip the mixture into a 20 cm loose bottomed tin (about 8 cm deep) and press down firmly with your fingers or the back of a spoon to form the biscuit base. Cover with cling film and leave to rest in the fridge. Separate the eggs and whisk up the whites until soft peaks form. 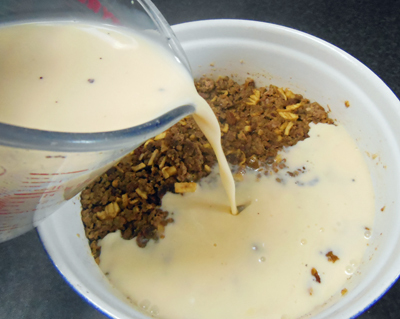 Add the egg yolks and vanilla essence to the cheese mixture and stir to combine. I do this bit by hand with a metal spoon. Next, add just a spoonful of egg white to the cheese and stir in to slacken the mixture. Then very gently fold in the rest of the egg whites attempting to keep as much of the air in the mixture as possible. Tip the mixture onto the biscuit base and bake in the oven for 20-25 minutes or until the cheesecake is puffed around the edges but still wobbly in the centre. Turn off the oven but leave in the oven to cool. Chill well in the fridge and serve well chilled. For a chocolate ripple version, add just half the finished mixture into the tin in spoonfuls with gaps between the dollops. Then add 150g of melted plain chocolate to the remaining mixture and spoon into the gaps. Finally, swirl the top with a skewer or knife to make a marble effect. Make sure that the chocolate is not too hot when you add it otherwise it will start to cook the eggs in the cheesecake mixture. Cracks always appear in my baked cheesecake. I have a feeling that the air in the egg white in this recipe probably encourages the mixture to crack, but I’d rather have a light texture and cracks than a stodgy texture with no cracks. To be honest because it’s only an aesthetic thing and it still tastes good I’m not particularly bothered. If you are then there are some tips to avoid cracking in this link. If you hit on a winner then please do let me know. It the meantime I’m going to opt for the last suggestion and cover the cracks with sauce. This dish with apparently Indonesian origins seems to have become a (white?) South African classic. When we were travelling in Southern Africa we stayed with some relatives in Johannesburg and this was dished up to us several times by different family members wanting to offer us a ‘real’ taste of South Africa. I think, like chili-con-carne or spaghetti bolognese here every South African household has their own version of this recipe passed down through the generations. I copied this one from my Auntie Sue’s recipe book before travelling back to the UK. I admit to being rather contrary when it comes to fruit in savoury food. Apple and pork is fine but pineapple on pizza is a definite ‘no’ and banana in curry is simply the devil’s work. Usually raisins and meat would send me running but I have to admit that it does work nicely in this dish. There was an option for tinned peaches instead of apple in Auntie Sue’s recipe but for me the tangy tartness of apple is preferable to sweet tinned peaches. 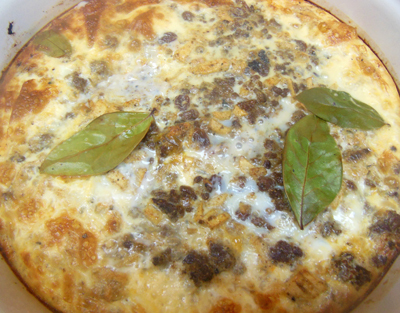 There’s something rather baby food like and comforting about Bobotie. It is very mildly spiced and sweet with a light savoury custard topping. It goes down very well with my children served with lots of rice. 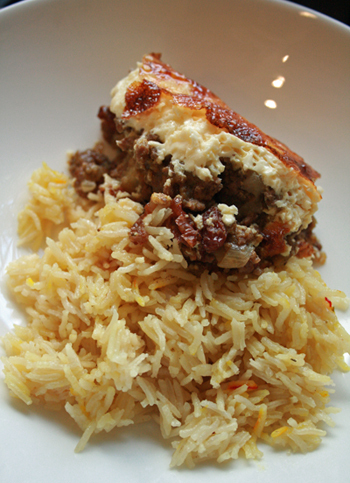 It also works well as a hot buffet dish as you can increase the quantity with very little extra effort. Preheat the oven to 180oC fan. Heat the oil in a large frying pan, add the mince and fry on a high heat until brown. Add the garlic, onion, curry powder and apple and cook for a couple of minutes over a medium heat stirring until all the ingredients are well combined. 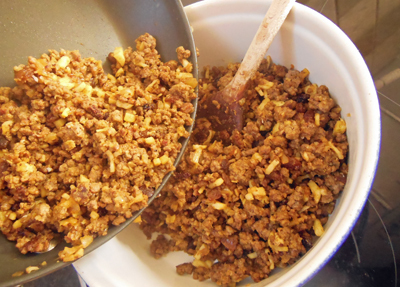 Add the sultanas, chutney, breadcrumbs and seasoning and stir to combine. Pour into a lightly oiled oven dish. Beat the eggs and milk together and season with salt and pepper. Pour this mixture over the meat and place the bay leaves on top. Bake for 45 minutes until the custard is set. 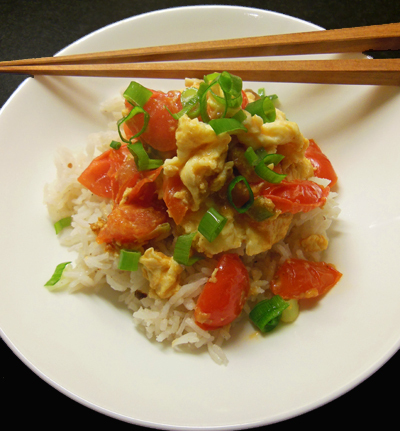 Serve with lots of rice (see my post – Nice Rice). I like to flavour the rice with saffron and turmeric. NOTE: Don’t be tempted to leave out the breadcrumbs (which I did do once) they are vital for the overall texture of the dish. Some versions seem to use slices of white bread cubed and then soaked in milk and stirred into the meat instead of breadcrumbs. This may be an option if you don’t have breadcrumbs to hand but I’ve not tried it myself. Generally I like to leave ‘wow’ food to aspiring and actual Michelin starred chefs, however there are times when it’s worth having a show-off dish in your repertoire that you can roll it out in situations where you really need to impress. Perhaps you’re trying to show your partner just how much you love them, or maybe you’ve invited that ultra-competitive colleague over to dinner and you want to really get under their skin. After a truly amazing meal at Van Zeller’s restaurant in Harrogate* with a couple of bottles of wine, I drunkenly completed the comments form and cheekily asked for the recipe for the crispy fried duck egg yolk that had been served with the starter. Low and behold an email came from Tom Van Zeller a few days later with the recipe below. It was several months before I dared to give it a try but I have to say that it was much easier than it sounds and it just looks so very impressive (as well as tasting delicious). 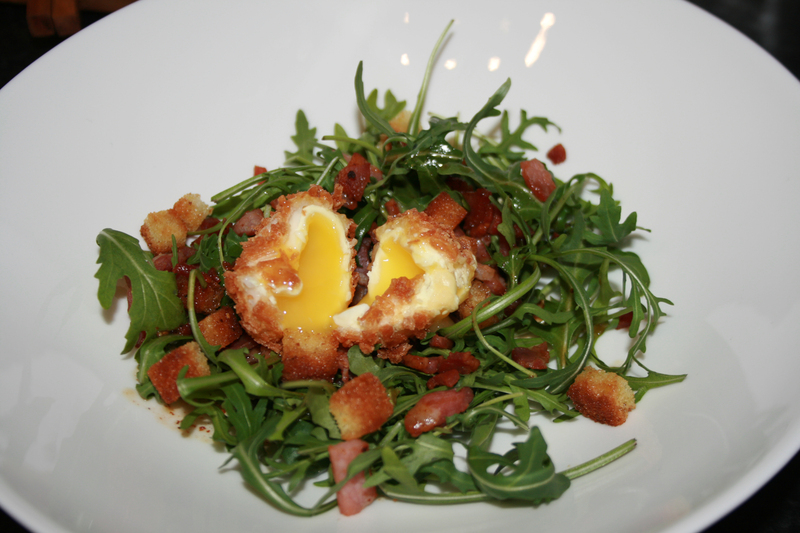 I served mine with a simple rocket, crispy bacon and croûton salad and let the egg do the talking. *I’m sure this restaurant will have a Michelin star soon.